The clinical part of these Guidelines and Recommendations produced under the auspices of the European Federation of Societies for Ultrasound in Medicine and Biology EFSUMB assesses the clinically used applications of all forms of elastography, stressing the evidence from meta-analyses and giving practical advice for their uses and interpretation. Diffuse liver disease forms the largest section, reflecting the wide experience with transient and shear wave elastography . Then follow the breast, thyroid, gastro-intestinal tract, endoscopic elastography, the prostate and the musculo-skeletal system using strain and shear wave elastography as appropriate. 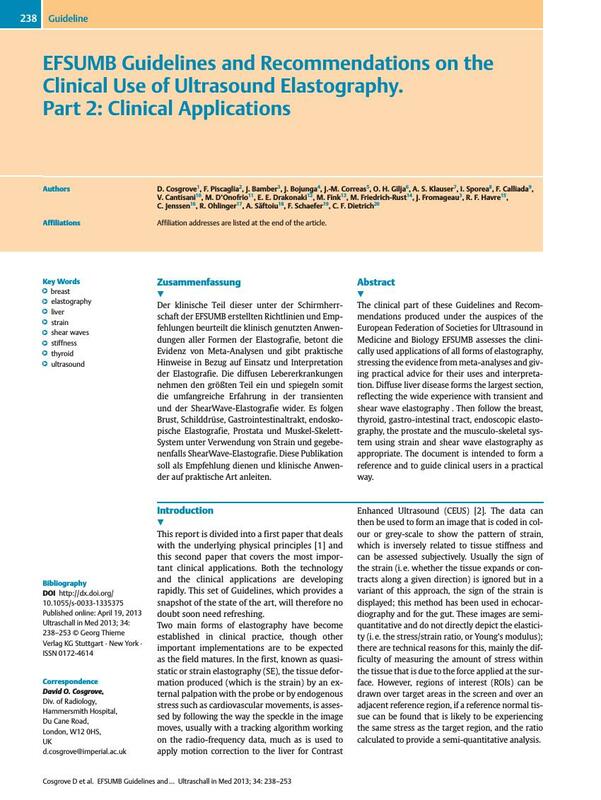 The document is intended to form a reference and to guide clinical users in a practical way. Der klinische Teil dieser unter der Schirmherrschaft der EFSUMB erstellten Richtlinien und Empfehlungen beurteilt die klinisch genutzten Anwendungen aller Formen der Elastografie, betont die Evidenz von Meta-Analysen und gibt praktische Hinweise in Bezug auf Einsatz und Interpretation der Elastografie. Die diffusen Lebererkrankungen nehmen den größten Teil ein und spiegeln somit die umfangreiche Erfahrung in der transienten und der ShearWave-Elastografie wider. Es folgen Brust, Schilddrüse, Gastrointestinaltrakt, endoskopische Elastografie, Prostata und Muskel-Skelett-System unter Verwendung von Strain und gegebenenfalls ShearWave-Elastografie. Diese Publikation soll als Empfehlung dienen und klinische Anwender auf praktische Art anleiten. 56 Bota S, Sporea I, Peck-Radosavljevic M et al. The influence of aminotransferase levels on liver stiffness assessed by Acoustic Radiation Force Impulse Elastography: A retrospective multicentre study. Dig Liver Dis 2013; DOI: doi.org/10.1016/j.dld.2013.1002.1008. 172 Klauser AS, Myamoto H, Tamegger M et al. Achilles tendon assessed with sonoelastography: histologic agreement. Radiology 2013; DOI: 10.1148/radiol.13121936.